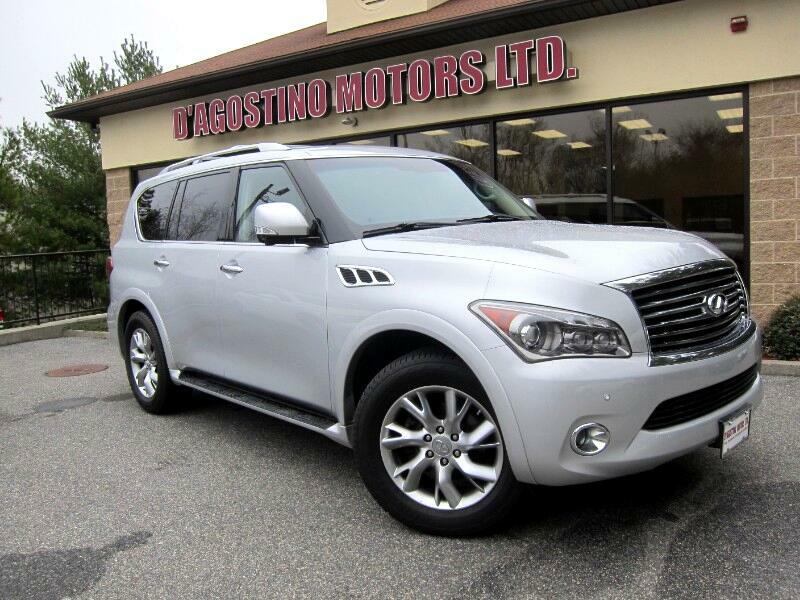 Used 2012 Infiniti QX56 4WD for Sale in Smithfield RI 02917 D'Agostino Motors Ltd.
NEW ARRIVAL !!! ONE OWNER !!! CLEAN CARFAX !!! IT JUST DOSEN'T GET ANY BETTER THAN THIS !!! THIS Q 56 JUST CAN NOT COMPARE TO ANY AMERICAN SUV OUT THERE !!! IT'S BETTER QUALITY !!! IT'S MORE LUXURIOUS !!! IT'S BETTER BUILT !!! IT'S LOWER MAINTENANCE !!! YOU HAVE TO COME SEE THIS ONE FOR YOURSELF !!! IT IS GORGEOUS !!! IT'S IMMACULATE !!! IT IS LOADED WITH EQUIPMENT !!! NAVIGATION , BACK UP CAMERA ,SURROUND CAMERA VIEW , 3RD ROW SEATING , REAR ENTERTAINMENT SYSTEM , BOSE PREMIUM AUDIO SYSTEM , BLUETOOTH , PUSH BUTTON START , POWER HEATED LEATHER SEATS , FRONT AND REAR , MULTI FUNCTION STEERING WHEEL. Come Experience the D'Agostino Difference! We Go Through our Vehicles with a Fine Tooth Comb from All Mechanical Aspects to an Extensive Reconditioning and Detailing Process, Expect to View the Cleanest Vehicles in New England Guaranteed !!! Visit D'Agostino Motors Ltd. online at www.dagostinomotors.com to see more pictures of this vehicle or call us at 401-233-4000 today to schedule your test drive. Message: Thought you might be interested in this 2012 Infiniti QX56.